"You can't choose your mother, but you can choose your motherboard." 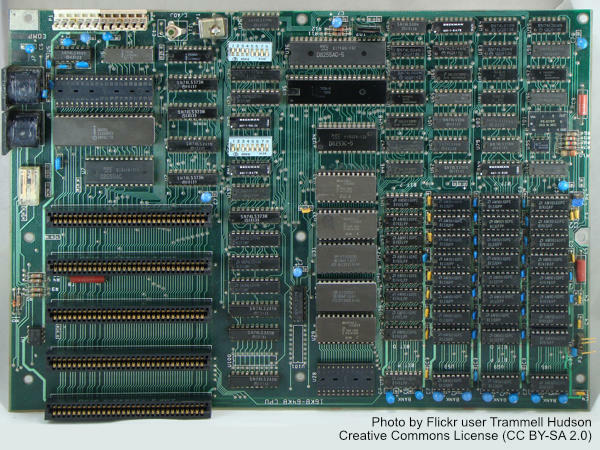 Back in the olden days of computing, the motherboard (like the original IBM PC motherboard shown here) was home to the processor, the chipset, the CMOS chip, and very little else. All of the other components were mounted onto the motherboard and were often called "daughter boards" or "daughter cards." Even when this site was first written, very few motherboards had integrated video; and integrated audio was just starting to catch on. At the time of this revision, most desktop motherboards have integrated video either on the board or on the processor; and almost all motherboards have integrated audio and network adapters built right into them. Collectively, these are called integrated peripherals because they do the jobs that used to be done by add-on cards back in olden times. Most motherboards also have expansion slots into which you can install expansion cards if integrated components don't meet your needs or if they fail. For people running standard desktop applications and light photo and video editing, the integrated peripherals on a decent motherboard will probably do just fine. That can save you a lot of money if you're building a computer to do things like word processing, checking email, and surfing the Interwebs. Gamers, scientists, architects, graphic artists, people who edit videos on a regular basis, and other users whose applications require more video processing power, however, will need higher-end video cards than are commonly found integrated onto motherboards. Likewise, musicians or music editors who use recording studio software may need to install specialized sound cards that perform better than the integrated peripherals. If you know from the start that you'll be using expansion video and audio cards in your homebuilt computer, you may want to consider buying a server motherboard and a server processor like one of the quad-core Intel Xeon series that don't have onboard graphics. Server motherboards and processors tend to be very rugged and powerful and can handle extreme use, but usually just have bare-bones audio and VGA video if they have them at all. If you're going to be installing expansion audio and video anyway, it's worth considering buying a motherboard and processor designed for servers. Just make sure the mobo has the right expansion slots for the cards you intend to use. Form Factor. The form factor is a set of standards that include the size and shape of the board, the arrangement of the mounting holes, the power interface, and the type and placement of ports and connectors. Generally, you should choose the case to fit the mobo, not vice-versa. But if you have space limitations, then you have to limit your choices to the size of case that you have room for. Processor support. You must select a mobo that supports the type and speed of processor that you want to use and that has the correct type of socket for that processor. RAM support. Make sure that the motherboard you select supports enough RAM of the type of RAM that you want to use. Most motherboards manufactured as of this writing can support at least 32 Gig of RAM, with DDR-4 RAM being the most popular type right now (in 2019). Some boards can support much, much more RAM than that. Chipset. The chipset pretty much runs the show on the motherboard, and some chipsets are better than others. The chipset cannot be replaced, so the only way to solve problems caused by a bad chipset is to replace the mobo. Read the reviews of other motherboards using the same chipset as the one you are considering to see if a lot of people have reported problems with it. This is especially important if you use an operating system other than Microsoft Windows. On-Board Features. Do you want integrated audio or video? If you don't plan on using the computer for graphics, multimedia, or gaming, then you may be able to save money by buying a motherboard with less-than-spectacular integrated audio and/or video. SATA support. All modern motherboards support SATA these days. What you need to make sure is that they support the fastest SATA standard at the time you buy the board, and that the motherboard has enough SATA headers for all the drives you plan to install. Expansion Slots and Ports. How many of each type of expansion slot are included? Will they be enough to meet your current and future expansion card needs? How about Firewire support? And does it have enough USB ports and headers for all the peripherals you want to dangle off of it and all the leads your case needs to power its front-side ports and card readers? Are they the latest and greatest version of USB? Reputation. When choosing a motherboard, reliability is the most important factor. Replacing a failed motherboard requires essentially disassembling the entire computer, and may also require reinstalling the operating system and applications from scratch. Once you've narrowed down your choices, search online forums to see if others have found the boards you're considering to be a lemon. One excellent Web resource for motherboard research is Motherboards.org. Compatibility With Your Operating System. All new motherboards include drivers for the current and recent Windows versions (but check the documentation just to be sure). If you plan to use the board for a computer running another operating system (Linux, UNIX, BSD, etc. ), check the with the motherboard manufacturer and the hardware forums for the OS you will be using to see how that particular board has worked out for others. RAID Support. RAID (Redundant Array of Independent Disks) is a set of protocols for arranging multiple hard drives into "arrays" to provide fault tolerance and/or increase the speed of data access from the hard drives. Many motherboards have hardware RAID controllers built-in, saving you the cost of installing an add-on RAID controller if you plan to use RAID. Cost. Even if you are on a budget, the motherboard is not the place to cut corners. Try a less fancy case, instead. But at the same time, the fact that one mobo costs twice as much as another doesn't mean it is twice as good. By searching forums and reading hardware reviews, you're likely to find some inexpensive boards that perform as well as (or maybe even better than) boards costing a great deal more. PC Part Picker is a good resource for getting opinions about computer parts, including motherboards, before you spend any money.